Work has been busy! To the point where I have stopped responding to texts, pushing study prep for grad school, and even not meeting people I really want to meet. I have been so bad that sometimes I’ve even lied that I didn’t see the text when to be honest, I saw it but had zero energy to tell you how I was feeling. This is also the case with this blog. I love the cooking process because I make ample time for (in lieu of sleep) but the writing process takes time. It’s a result of making sure each article has something unique and my insecurities that I don’t write well enough. Both need to be worked on but I am actually quite happy with how the blog has been turning out this year. I think for the first time in a while, I can see some return on investment with people finally reading, a subscriber list growing, and an exponential growth in my engagement rate on Instagram. Spiel over, let’s get to the story. I want to talk about dating this week. I love meeting new people. Its such a nice way to understand the diversity of the city you inhabit and is equally introspective with each answer of yours getting a different reaction/response. I have levels of conversation with every new person I meet and depending on the time, location, and levels of vulnerability they can go from— “your dog is super cute” to “have you ever thought of how you will die?” Of course if you love the latter question, check out my vulnerability questionnaire— a college project that turned into a salve for meeting new people after a long painful breakup. I haven’t been in a relationship since December 2016. Not that I haven’t wanted to be in one but logistics, feelings, and stupid graduate school have come in the middle (YOU, if you’re reading, you know who you are). My work wife Aakanksha who is one the only person I have worked with for so long is my favourite person to talk to about relationships. We screen my Instagram together, find degrees of separation between the person and us, and play out scenarios with every person I am interested in. She is also very perceptive to a point where I think of things and she has an idea of what I’m thinking. It’s very annoying but also saves time to be honest. At this point she has become one of those people that I need no filter with. One of the days that we were doing our screening, I went on this monologue about what I’ve learnt when it comes to dating, attraction, and why I am not dating anyone. I believe that you should only date someone when two things converge together for you: physical attraction (your perception of pure phenotypic characteristics of a person) and content (the conversations and the value they bring to you when you meet them). As much as you should love the person inside— there needs to be physical attraction! It can be something that you realise after you engage in content, or something that grows when you once there’s a vibe or sometimes, its the only thing that compels you to meet someone. I have had all three of these happen to me but the only people that I still talk to are the ones that come with great content too— people who, like the same similar things, push you to look at something differently, or simply people who can add to conversation. And this isn’t like a fuel gauge, where more of one can be a substitute for the other. Attraction can’t be all. Nor can content, it needs to be an equilibrium that tends to be achieved with more of content but not always. Since 2016, people both old and new have always seemed to have more of one and less of the other. Apart from a few outliers, most have been fun but not to a point that dating seems like the natural next step. So till that time, I am happy dating, meeting new people, chilling with Besan and cooking! 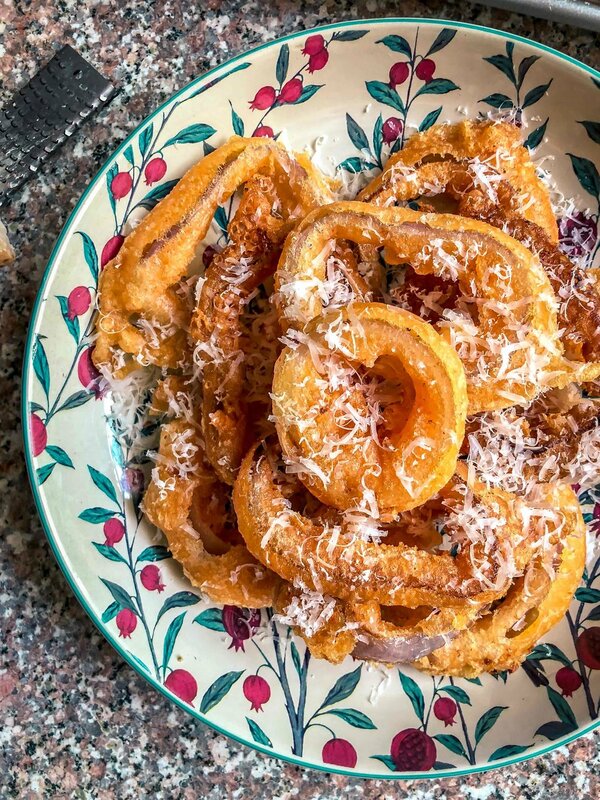 Speaking of cooking, these onion rings are a perfect allegory to this content, attraction equilibrium. A lot of research (aka lunch breaks where people think I am working but all I’m doing is reading recipes) went into this recipe— Bobby Flay, Bon Appetit, and J. Kenji Lopez have been key sources of information. From Bobby, I learnt that the shell doesn’t have to be thick because you want to taste that slight caramelised onion and NO panko (shocking, I know! ); Bon App taught me a simple beer batter; and J. Kenji imparted the knowledge of freezing the onions to remove their inner turgid skins along with attain that perfect browning by using some vodka. I too added my own inputs— garlic powder to get that sweet onion taste, peanut oil to maintain an equal temperature and reduce the amount of fried residue in the pan that usually causes discolouration while frying. All this thought and research resulted in not only an onion ring that looked visually stunning (light airy, imperfect but perfect) but also tasted like a warm crispy onion. Content and attraction in perfect equilibrium (well, almost). Separate the onion rounds into individual rings. Place on a plate and keep in the fridge for about an hour or until the onion freeze over. When ready to fry, remove the onion rings from the freezer, thaw under tepid running water. Transfer to a rimmed baking sheet lined with a clean kitchen towel or several layers of paper towels and dry the rings thoroughly. Carefully peel off the inner papery membrane from each ring and discard (the rings will be very floppy). Set aside. Slowly add the beer mixture to the flour mixture, whisking constantly until the batter has texture of thick paint (you may not need all of the beer). The batter should leave a trail if you drip it back into the bowl off the whisk. Do not overmix; a few small lumps are OK.
Dip one onion ring in the batter, making sure that all surfaces are coated, lift it out, letting the excess batter drip off, and add it to the hot oil by slowly lowering it in with your fingers until just one side is sticking out, then dropping it in. Repeat until half of the rings are in the oil. Fry, flipping the rings halfway through cooking, until they are deep golden brown, about 4 minutes. Transfer the rings to a large mixing bowl lined with paper towels and toss while sprinkling salt over them. Serve with ketchup, mayo, or a fry sauce. This Diwali, I make my grandmother’s sweet semolina cookies. See how you can make them too!